As of September, the Town of Blackfalds is now officially the only place in Canada sporting an indoor leg of the Trans Canada Trail. Sean Barnes, community services director, said with the town already so proud of the highly . . . The only indoor portion of the Trans Canada Trail, which goes through the Abbey Centre, officially opened Friday with a ribbon cutting ceremony. "Blackfalds is a very active, very dynamic community," said Ross Hayes from Alberta . . .
Another local link to the Trans Canada Trail has been completed. On Sept. 19th, trail lovers and dignitaries gathered at the Abbey Centre to officially open the latest link of the Trans Canada Trail at the Abbey Centre in Blackfalds, . . .
Nestled behind a hill northeast of the Abbey Centre along the Trans Canada Trail sits a magnificent $225,000 amphitheatre, almost hidden. Many people don't know it's there but the stone arc that seats 250 will soon host . . . The Town of Penhold and the Central Alberta Regional Trail System (CARTS) are joining forces to create a trail system in Penhold as new residential areas are being developed. "The town has put together a request for grant funding . . . Being the largest aquatic centre in Alberta isn't the Abbey Centre's only claim to fame. The facility also has the only indoor portion of the Trans Canada Trail (TCT) in the entire country. "It's amazing," said Debbie Olsen, past . . .
Picnics, bird watching, horseback riding, fishing, paddle boat cruising -- you name it. Waskasoo Park, Red Deer's great outdoor treasure, has it all and much more. Dave Matthews, Parks Planning and Technical Services . . .
A new provincial initiative is aiming to improve existing recreational trails, but the infusion of cash will not help efforts to expand the local system. The province announced on Saturday -- International Trails Day -- that it was . . .
Marathon runner Bill Nielsen operated under the belief that it is easier to ask forgiveness than seek permission, quietly and secretly blazing new trails where he and fellow runners could race and train. Metre by metre, those . . .
Red Deer County and Central Alberta Regional Trail Society (CARTS) have taken one more step towards a Red Deer to Bowden and Sylvan Lake trail. Red Deer County recently passed a motion to apply for Alberta TrailNet funding for . . .
Good news indeed that Alberta Transportation changed its mind and will support shared-use trails along selected highways. I have always wondered, as I pedalled along some rather narrow highway shoulders, heavy trucks . . . The Central Alberta Regional Trails Society has been getting some good news lately. Last month, Prime Minister . . . The Town of Blackfalds is set to put the final link in the chain. 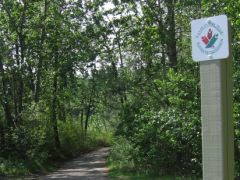 In the 2008 Facility and Parks Needs Assessment, town officials made connecting to the Trans Canada Trail (TCT) a priority and after acquiring and subdividing the final . . . Contributions to the Trans Canada Trail Foundation will go a little further from now on as the federal government aims to have an unbroken national chain of recreational trails go as far as Canada's three oceans by 2017. After . . . There may have been a nasty snowstorm blowing through the evening of Nov. 2 but it did not deter scores of business people and citizens from taking in the sixth annual Rotary Night at the Innisfail Library Learning Centre. The . . .
Dana Meise is aiming to be the first Canadian to have walked to all three of Canada's kilometre zero signs. The Thunder Bay, Ont. man, who originally hails from Prince George, B.C., is in the sixth year of his journey to solo . . . When Dana Meise began his cross-country trek on May 6th, 2008 he set out from Cape Spear, Nfld. to be the first man to walk the entire 23,000 km Trans Canada Trail. He has walked more than 13,000 km, walking six months straight . . .
After hiking more than 13,000 kms across Canada Dana Miese had a chance to see something he hadn't seen since he was a teenager, the house in Red Deer he lived in when his life was changed forever. Speaking Thursday as he was . . . The groundwork has been laid for a recreational trail linking Penhold, Bowden and Innisfail, but any potential work on the ground is likely a long ways away. The three towns and Red Deer County have partnered to investigate the . . .
"Build it and they will come @TCTrail ...Meet Horst & Ursula from Leverkusen Germany who spend summers here in Canada. They tell me the LOVE the Trans Canada Trail and they use it to cycle from Red Deer through Blackfalds . . .
Last year Edmund Aunger's wife died in a collision while the Edmonton couple was bike riding in Prince Edward Island. Elizabeth Sovis had recently retired and, as an avid cyclist, had wanted to work towards helping the . . .
"This bridge is part of the Trans Canada Trail in Ponoka Alberta. It spans the Battle River, yes the same Battle River named after Battlefords Sask. lol...that was so 1000 km's ago! Did you know Ponoka is a Blackfoot word meaning Elk? . . .
Cyclists, joggers, hikers and cross-country skiers could soon travel between Penhold and Bowden via a proposed regional trail network. The communities of Bowden, Innisfail and Penhold, along with Red Deer County, are . . .
Olds' network of paved trails was extended by two kilometres after the Richardson family completed work on trails as part of the development of the Highlands subdivision in the southwest section of town. The Richardsons, who own . 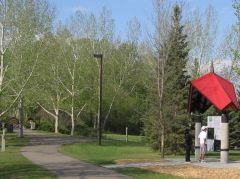 . .
A unique Trail opened in Central Alberta on June 15; the eight-kilometre Lacombe County Trail is a fully paved path stretching through rural countryside to connect the towns of Lacombe and Blackfalds, and features interpretive . . . I have heard very positive comments and one or two negative comments. From that I assume that either a majority of the residents of Lacombe County are in favour of the trails or don't know anything about them and where they are. I . . . The grand opening for the new Lacombe County Trail connecting Lacombe and Blackfalds was held on June 15 and attendance was excellent despite blustery weather. About 100 people turned out to watch Lacombe County Reeve . . .
JJ Collett Natural Area recently finished a new boardwalk, giving access to a section of the trails that, due to flooded lowlands, hasn't been easily accessible since 2008. Society vice-president Roger Stawart says now people can easily . . .
Red Deer may boast an extensive trail system, but neighbouring Lacombe County recently added a stretch of trail that is unique in Central Alberta. The Central Alberta Regional Trail Society officially opened a new leg of the Trans . . . Interpretive signs will be going up this week on the Lacombe Lake Trail, the new Lacombe County trail that connects the City of Lacombe with the Town of Blackfalds. When you go for a walk on the trail and check out the signs. Keep in . . .
Alberta TrailNet Society is Alberta's provincial trail council, a non-profit charitable organization supporting the ongoing development of Alberta's provincial trail network, including implementing the Trans Canada Trail. . .